CTT | Churching the unchurched? A theme or apologetic used by the seeker-sensitive and emergent (post-modern progressive christians) for taking it upon themselves to redefine the Church, Praise and Worship, and the role of the Pastor is their claim to be “churching the unchruched”. Is that valid? What does that even mean? Let’s discuss. What sets this book apart is… being based on hard data and real life examples? Okay… should a book about Church and Evangelism be based on Scripture? Yes, actually, it should be. Ephesians 2:19-21 (ESV) 19 So then you are no longer strangers and aliens, but you are fellow citizens with the saints and members of the household of God, 20 built on the foundation of the apostles and prophets, Christ Jesus himself being the cornerstone, 21 in whom the whole structure, being joined together, grows into a holy temple in the Lord. Purpose of the Church for the Unchurched? What is the purpose of the Church? The gathering of the assembly? The seeker-mergent belief (and teaching) is that the assembly of the saints is supposed to be where unbelievers are supposed to hear the Gospel and become believers. But what prevents an unbeliever from attending church in the first place? These seeker-mergent teachers would have you believe that how traditional churches present the Gospel (you know, preaching Law (sin) and Gospel (repentance) and the forgiveness of sins) that has been “failing”. So, they inevitably get caught up in dialing down the preaching of the Law (sins become “mistakes”) and over-emphasizing God’s Love (by avoiding His Holiness, Justice, Righteousness) trying to compel unbelievers to first agree to attend this non-church style of Church and then later “make a decision for Christ” based on how “loving, warm, engaging, inviting, and welcoming” the congregation is. They are led in a prayer, told they are saved, and then they are fed a diet of self-help legalism that Christians must abide by to establish their Christian-ness. But that legalism isn’t based on Law-preaching, because now that they are “saved” the purpose of their church is no longer them, but the other “unchurched”. So they are expected to read the Bible on their own, while from the pulpit they hear life tips from the latest Christian self-help book, or simply from the pastor’s life experiences. What does the Bible say about the purpose of Pastors and the Church? So we have here a picture of teaching and preaching being presented in terms of food. I believe that when Jesus appeared on the shoreline, the disciples remembered what Jesus taught at Peter’s confession. We also see that the disciples understood the teaching of the leaven of the Pharisees and Sadducees was in their teaching, not in actual food. The religious leaders of that day taught themselves, their doctrines, and their righteousness. Jesus rebuked them repeatedly, pointing out to them that if they had indeed believed Moses and his teaching, they would believe in Jesus (John 5:45-47). They added to the Law and the Prophets with their oral tradition and interpretations of the Law and Prophets, they introduced their own leaven to the Bread of Life (Jesus, the Word made flesh). At breakfast, Jesus addresses Peter specifically, and asks three times “do you love Me”. What goes on the Greek is fascinating, but for now, let us focus on Jesus’ response, “feed my lambs; tend my sheep, feed my sheep”. Is Jesus just talking about food here? No. Is he saying that Peter is supposed to find his own way to feed the sheep? Absolutely not. Looking back at Peter’s confession of Christ, notice that Jesus specifies that the revelation was from God; therefore, Peter’s confession is the rock upon which Jesus will build His Church, not Peter’s flesh (the Greek makes it very clear) though Peter’s name is changed. When we look back at Jesus’s rebuke of His disciples for worrying about not bringing bread, Jesus points out that He had already demonstrated that He will provide for our earthly needs, that clearly He is focused on more important things for the church. God provides the physical bread and fish, and He also provides the Spiritual bread, the Gospel of Jesus Christ, by which Peter is to feed and tend the flock of Christ (the Church). 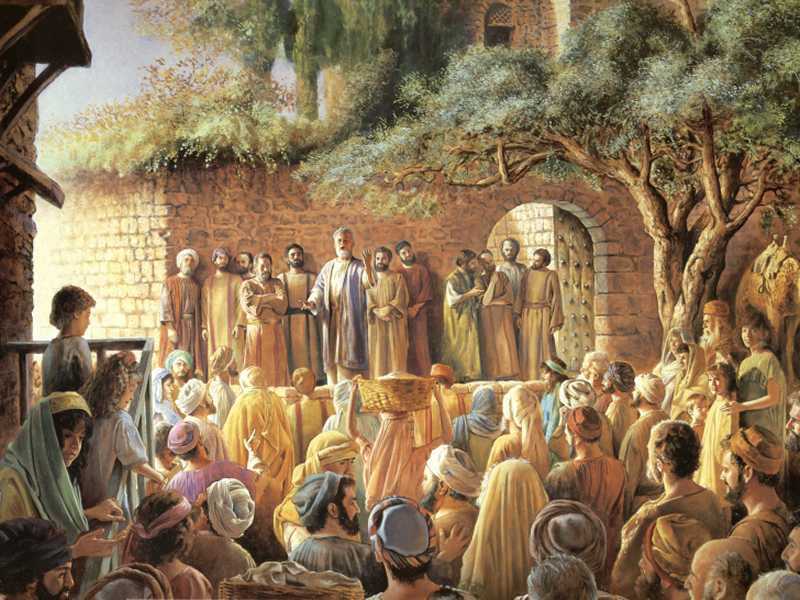 Yes, the early Church first evangelized the Temple (in Jerusalem) and the synagogues. Does that mean that the purpose of Church is to get unbelievers to attend so that they can become believers? No. Please don’t freak out on me just yet, let’s first discuss what was going on in the early church. After Christ’s ascension into Heaven, we see the first assembly of the Church. Does this look like a church whose focus is on attracting the “unchurched”? No. Who added to their number? The Lord did. Who was being added? Those who were being saved. The Church, God’s Church is for the Christians, those who have believed in the Gospel of Jesus Christ. Any attempt to tailor a Church for those who are unbelievers is an exercise in futility. Let’s see how Paul addressed this idea in his letter to the Romans. At the close of chapter 9, Paul is trying to fix some misconceptions some Gentiles had regarding the Jews. Let’s begin there and move into chapter 10. 14 How then will they call on him in whom they have not believed? And how are they to believe in him of whom they have never heard? And how are they to hear without someone preaching? 15 And how are they to preach unless they are sent? As it is written,“How beautiful are the feet of those who preach the good news!” 16 But they have not all obeyed the gospel. For Isaiah says, “Lord, who has believed what he has heard from us?” 17 So faith comes from hearing, and hearing through the word of Christ. We are not born with faith. We are in-fact born in unbelief, dead in sins and trespasses. Faith is a gift from God, one that comes only by hearing the word of Christ, the Bread of Life. The leaven of the Pharisees is to be avoided and has no part in Christ. It doesn’t matter how awesome/entertaining/welcoming your church service is to the unbeliever, unless they hear unleavened preaching, they will not obtain faith necessary for salvation. Your “testimony” of Christ’s forgiveness isn’t enough, neither is your band’s rendition of “Awesome God”. For it is by hearing the Word of Christ that faith comes. The Church is the body of Christ, and there is no way to have a church that “churches” unbelievers. Unbelievers who come to the church should undeniably be presented Law and Gospel so that they might become believers (faith comes by hearing the Word of God), but the responsibility for bringing them in rests with the Christians, not the Church. Jesus told Peter to feed and tend His flock. Again, the Church is the body of Christ, Christ is the head of His body. We are to share the gospel with the unbelievers, and invite them to the Church of Jesus Christ, we don’t decide to change the focus of Christ’s Church so that it is more palatable for unbelievers. 20 Where is the one who is wise? Where is the scribe? Where is the debater of this age?Has not God made foolish the wisdom of the world? 21 For since, in the wisdom of God, the world did not know God through wisdom, it pleased God through the folly of what we preach to save those who believe. 22 For Jews demand signs and Greeks seek wisdom,23 but we preach Christ crucified, a stumbling block to Jews and folly to Gentiles, 24 but to those who are called, both Jews and Greeks, Christ the power of God and the wisdom of God. 25 For the foolishness of God is wiser than men, and the weakness of God is stronger than men. There is only one way to the Father, and that is through Christ. Getting someone to join in an attendance ritual on Sunday morning isn’t going to grant faith, unless they are hearing the unleavened Word of God. Changing what is heard on Sunday morning so that unbelievers will “sign up” doesn’t bring them closer to repentance. Unless we preach Christ and Him crucified for our sin, we’ve simply invited lost sinners to a social club built around “positive messaging”.